Optimizing your entire email marketing process can take a ton of time. Since it’s rare to feel like you have a week to get everything perfect, I want to give you a list of changes that will result in quick wins, but not take more than about 30 minutes each. If you pick 3 of these and implement them over the next week you’ll have significantly improved your marketing processes. This tip is for people who have less than 100 email subscribers. If you do this right you’ll finish the exercise with 10 new email subscribers, a list of exactly where your target audience hangs out online, and material for your first 5 to 10 blog posts. Now when you tweet about your email newsletter you can attach this card and grow your list directly from Twitter. After creating the card you should take it a step further and pin a tweet about your newsletter to the top of your Twitter profile. Now when someone clicks through from a retweet, or just from seeing your name around Twitter, they’ll see a great call to action to join your email list. To learn more about how to setup Twitter lead cards read this article. 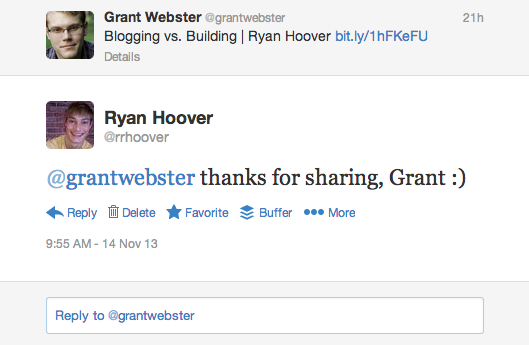 Ryan Hoover wrote an interesting post on using Twitter to grow your email list. I think it’s especially valuable in the early days when each subscriber to your list is worth even more. 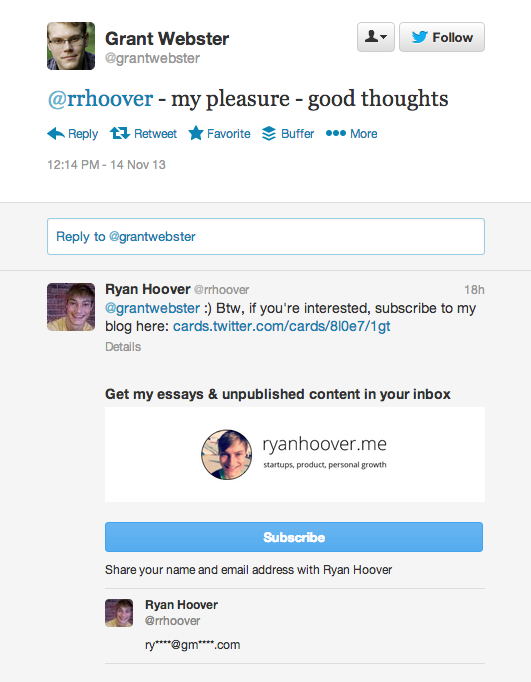 He’s using a Twitter card there (which ConvertKit supports), but you could just include a link to your newsletter page. It takes time, but it could be a good way to grow your list by 20-30 people. Ryan says that he gets a 60-80% conversion rate on these personal tweets. This obviously works best if people are sharing your content—social sharing makes growing a list is much easier. Want a quick way to increase social sharing? Write a guest post for a popular blog like The Next Web or Mashable. These sites have a lot of traffic, but often won’t let you use a strong call to action (since they don’t want your newsletter signup interfering with their own). But many of these articles are shared on Twitter over 100 times, so that gives you plenty of people to reach out to. After people join your list they should receive an automated series of your best content. This email course will introduce the new subscriber to you and your work, but you can also solicit great feedback if you ask for replies. For his Freelancer’s Weekly newsletter, Brennan Dunn asks new subscribers to reply with their biggest pain right now as a freelancer. He then labels these responses in Gmail and has built a stockpile of future topic ideas for his blog. And when he needs to write a sales page, he has a goldmine of the exact language his audience uses to describe their pains. Brian Casel asks in his welcome email for new subscribers to reply with what they’re working on, their top goal, and their biggest challenge. All so he can get a better idea of who is on his list and learn to serve them better. Email providers like Gmail are now starting to factor replies into their quality scores for emails. If someone takes the time to reply to a marketing email, it probably wasn’t spam. So that’s just one more reason to use an automated email to start a conversation with your audience. In my last few years of blogging I’ve seen dozens of people make a journey that starts with: “I hate pop-ups! I’d never use them.” to gradually being convinced to give them a try, and then keeping them around because they convert so well. Whether you like it or not, modals or pop-ups convert very well. If you haven’t already, you should test them for yourself. Also you can set them to display in a way that won’t drive your visitors crazy. I prefer to have them appear only on exit intent (so they won’t be in the middle of reading an article) and then not appear again for at least 30 days. You could also set them to not appear on mobile since the “don’t show for x days” setting wouldn’t be respected on browsers inside apps like Twitter and Facebook. This will work to get some subscribers, but it doesn’t clearly communicate what value the subscriber will get from signing up. For this CTA you actually explain the value each new subscriber will get when they join your list. Usually it involves giving away a free guide or a small bundle of resources and training. This is a giveaway that is specifically targeted to the content of the current post. Number 3 is what we’re going to be talking about today. It’s typically known as a content upgrade. To learn more about content upgrades, read Bryan Harris’ post. The one thing everyone focuses on when growing their list is total subscriber growth. Even though prioritizing overall growth makes a lot of sense, if you just focus on total subscriber growth you’re missing out on a lot of useful data. You should also know exactly where each subscriber is coming from. Referrer data will give you a rough idea, but many sites don’t pass it along and so it tends to only give you a partial picture. With referrer data you’ll know you picked up 25 new subscribers from Twitter yesterday, but it won’t help you know whose tweet they came from. That’s why you need campaign tracking as well. In ConvertKit you can add ?ref=campaignname to the end of any URL and you’ll receive visit and subscriber counts, as well as conversion rate, for each campaign. So let’s say I’m working on a new course and I launch the coming soon page. When I do that I send personal emails to friends asking them to share the page. Now I’ll get unique stats for each of these links inside ConvertKit. Looking at this you can see exactly where each subscriber came from and a conversion rate for each one. In our example of asking friends to share, you would know exactly which friends sent you the most email subscribers. And you could tease Josh that his followers converted at a lower rate than Brennan’s. This is built into ConvertKit by default, but you can hack it together in most other email providers. Here’s how to set it up in MailChimp. If you look in Google Analytics I bet your home page is the most visited page on your site. There are a few exceptions, but on 90% of sites I’ve looked at, that’s the case. So why is that often the least optimized page for collecting email subscribers? This is good, but the home page also has all the usual stuff on it: blog posts, navigation links, podcast episodes, and a lot more. Which makes sense. It’s the home page of a site and it’s supposed to serve as a jumping off point for all things Chris Ducker. But anyone who knows conversion rate optimization will tell you that focusing exclusively on your call to action, and removing everything else, will significantly improve conversion rates. On your first visit to Mixergy.com you’ll see a page optimized to collect email subscribers. On future visits it will take you to the actual home page which has more of a traditional blog layout. A welcome gate may be too extreme for you, but at the very least you should add a prominent email opt-in form to your home page. At the top of every post on the Zapier blog there is now a clear opt-in form to join their email newsletter. That’s it. Simple, but effective. None of these are huge changes, but each one will give you a noticeable lift in the value of your email list. So pick at least three of them and schedule out time to implement them in the next week. Do you have your own tip? Drop it in the comments below. If some of these sound too complicated to implement—or you don’t want to hack them together or write custom code—you should check out ConvertKit. If you’re a professional blogger, you’ll finally be able to use a tool tailor-made for you. For the next week (until April 17th) we’re doing free migrations on any of our professional plans (starting at $49 per month for up to 3,000 subscribers). Normally that’s something only available to customers on our $249+/month plans. If you’re interested, send an email to support@convertkit.com. We’d love to have you! Tons of great tips in here Nathan, thanks for laying it all out. I’ll be sure to add a few of these to my next email. Great post Nathan! Thanks for sharing. In addition to a Welcome Gate I suggest testing out a Feature Box. Unlike a Welcome gate, a feature box is visible on all pages (or as many as you’d like), versus a welcome gate is only visible on the home page. This is all so valuable!! I am so grateful you wrote this. Definitely one of the best posts on email marketing I’ve read for awhile. You actually said something helpful and different, instead of all the basic info that’s already out there. This article comes into my email in a perfect time as I just pushed live (used Ryan Hoover’s phrase) a new aSmallTrip.com, a storify like site for Instagram travelers. I would greatly appreciate any feedbacks via comments or email as to how I should go about doing marketing. I love this article because Nathan outlined the most important strategy for bootstrap marketing: finding who we are building product or writing for. My goal for aSmallTrip is for it to be a community for Instagram travelers to learn cool trips/travel stories from each other. Hence, they are my users. I also really loved how Ryan Hoover jump started product hunt using daily email lists, I figure aSmallTrip would be a regular emails sent out to users featuring fresh trips contributed by Instagram travelers. Before reading this article, I have sent out 15 personal emails to 20 Instagram travelers (of different type) asking them if turn their Instagram pictures into travel stories. I tried customizing message to speak directly to each and every one of them. I got 3 responses, 2 are interested in contributing, 1 is not (she is kind of big already on Instagram). After reading Nathan’s article, I realized I did not go specific enough. I did not treat these 20 people as 20 people that are very important to aSmallTrip.com. So I’m making a shift: starting today, I will hand pick 10 instagram travelers every day, send an email to each indicating s/he is invited to contribute ONE trip on aSmallTrip.com, in return, we will send him/her a first email newsletter featuring other 9 Instagrammers, and I will also list their names, so everyone gets excited because they are all very interesting travelers. This is actually a reLaunch with a focus on building UGC community, instead of a content play like I did last year by hiring lots of writers. What do you guys think of my new strategy? I know there are lots of capable experienced marketers, social media experts, entreprenuers reading Nathan’s blog. I’d love to hear your thoughts, please email me back at contact@aSmallTrip.com or comment here, I also made a video explaining how the new aSmallTrip works: https://freeflowapp.com/v/1s7oomc, I’d love if you want to contribute. Regarding twitter card strategy, and thank people who shared your stories: these are great ideas. I just did a search on twitter and found bunch of sharers from last year. Thanks for the tips. Number 2 seems especially powerful. I have just started using Twitter and it seems like a popular method is to private message someone and ask them to check out their site and follow. This method seems a little forced, especially when it is a generic message. The Twitter card seems like a much better option. It will be there when people click on my profile when I tweet interesting things. Thanks for the tips Nathan. Nathan, I think you’ve convinced me to go with Convertkit. Outstanding work as always. I have multiple lists in Mailchimp…the annoying part is I have the same people in multiple lists, but mailchimp counts them as different people (meaning my “list size” in mailchimp is bigger than it actually is). Would convertkit count these various lists / segmentations (or howeve it would specifically work in convertkit) against me? Yeah, we don’t have that problem. We are subscriber focused, rather than list-focused, so you can track everything about subscribers, but won’t be charged for duplicates (like with MC). I’ve been reading different marketing blogs for like 5 years or so.. and eventually I’ve stopped reading 99% of them, because they post crap..
thanks for another great article! I’ve noted quite a few things that I’m going to try real soon on my blog! Excellent post. Like the reasoning behind the exit intent for a lightbox pop up. Done! However, I’m no Twitter expert and for the life of me I can’t find how to make a card for free. Unless tats the point, and it’s not free. Just wanted to ask if anyone knows where to go exactly. First time reader and really enjoyed the content in this piece. #2 & 3 really gave me some great ideas. I’d heard of twitter cards but never gave it much thought. I got sidetracked and went off to read them and now see the power in using them. Thanks for that! I definitely practice all the other tips you’ve described with the exception of tracking (#7). I REALLY need to start doing this more! Hi, Nathan, thank for great advices. I just start blogging and I will try all these out. Loved the twitter tip Nathan – I had no idea you could do this! Thanks for sharing, much appreciated. Pretty darn awesome article from the e-mail marketing king! Have you grown to the stage where you clean your email lists to keep them fresh ? Our lists are getting dated.